This proposition comes 12-years after Measure B was approved. It hopes to raise half a billion dollars for the very same purpose. The proposed rate of this parcel tax is $24.50 per $100,000 of valuation. Therefore, if your property is valued at $500,000, you'll pay about $123 per year for 12-years or $1,470 total. A flat parcel tax charge of $12 per year for 20-years or $240 total. As described in the City's current budget report, the City is planning on revising its Business License Ordinance with the intention of increasing business tax revenue by at least 10% for 2017/18. Today is the start of early voting. If you haven't yet done so, it's time to educate thyself. Unlike those who'd prefer you not give consideration to an alternative point-of-view, I very much recommend that you read the argument presented by the proponents of Measure D. It's chock full of specious statements that deserve rebuke. Click the images below to view the proponent's argument in favor of Measure D, as well as their rebuttal to my argument against. The argument in favor emphatically and dramatically states that if the UUT is not extended, the consequences will be "SEVERE" and "DEVASTATING." While such alarmist pronouncements may have seemed reasonable at the start of the recession, this incessant sky is falling rhetoric has become old and distasteful. If we are to believe that we are in the the very same state of emergency that we were in 7-years ago, then any threatened cuts should begin with the city's executive staff and the presiding Council. As the chart below clearly shows, the city does not have a revenue problem. 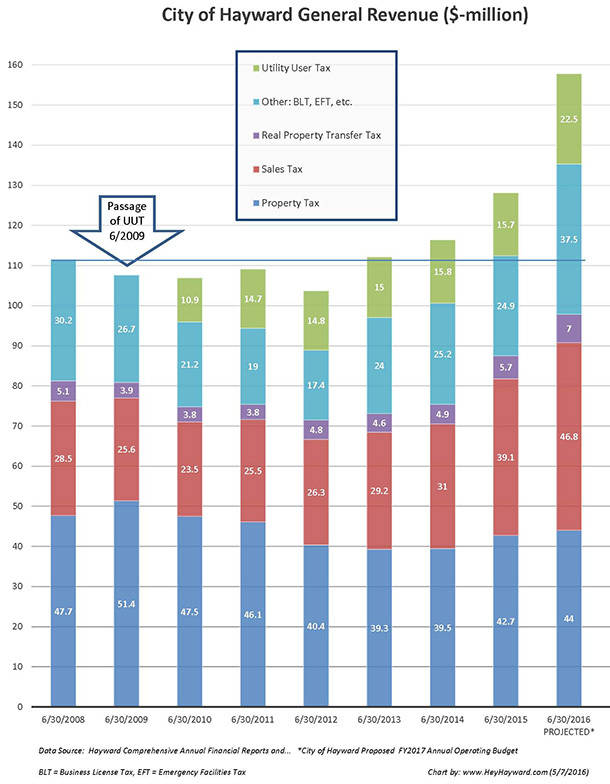 Property tax revenue continues to grow, the city's increased sales tax has kicked in, and we have three more years of the UUT. The argument in favor states that the current UUT "will expire shortly." No it won't. It will expire in the latter half of 2019--exactly 10-years after it took effect. At a City Council meeting, this past January 26th, the Assistant City Manager explained why it's before us now. She said, "in order to ensure that we renew this critical revenue source for the city, we have two shots at coming to an election; one in June of this year and one in June of 2018." While the statement is refreshingly candid; it confesses a plan that is entirely inappropriate. The city ought not be taking shots, preparing for possible multiple campaigns, to "ensure" our taxation. The proper approach is to provide citizens with a simple unbiased proposition at a time when it is most relevant. Only in 2018, would it be proper to consider the question: "Do we extend this temporary, supplemental tax, yes or no?" The city should not be spending tens of thousands of our tax dollars on costly marketing/polling consultants and campaign materials masquerading as "informational surveys." We shouldn't be repeatedly bothered by calls that ask "would you be more or less likely to vote for the measure if it said..."
And the electorate should definitely not be coerced with fear mongering, superfluous arguments that warn of severe and devastating consequences should the proposition be rejected. These actions do not represent a government by the people, for the people. Rather, it's a perfect example of the tail wagging the dog. The argument in favor states that the city "has worked hard to be fiscally responsible." Perhaps. But working toward a goal and actually achieving it are two different things. One can argue, and indeed I will in future posts, that the city has not been fiscally responsible--not always at least. But even if it has, so what? Is it not everyone's expectation that the city work hard to be fiscally responsible? This measure is not about rewarding a fulfillment of expectations, it's all about extending a burden on taxpayers. Whether you believe the city has been fiscally responsible or not is immaterial; responsibleness is not a compelling reason to extend this tax. The argument in favor proclaims that "by law, the State cannot take this funding away." This is just wishful thinking. The State writes the law and amends the law. For all intents and purposes, the State is the law. If the State desires funds from the city, it will have it one way or the other. If you believe the revenue from this particular tax is safely tucked away inside a mattress, then what difference does it make if an equivalent amount is just taken from those sources that you believe are vulnerable? Moreover, none of the city's funds are protected from legal judgments. This is the more serious threat looking forward. Regardless, at the end of the day, the notion that this tax is more protected than other sources is irrelevant. Attempting to guard against potential threats that may not materialize is not a justification to further burden tax payers now. The argument in favor states that the measure "lasts 20-years only." It might just as well be 50-years "only," as it's every bit as arbitrary. The existing 10-year timeline coincided with city staff's prediction for the real estate recovery. The timeline for this proposed extension is not based on any justified financial factor, but only on what the City Council believes the majority of the electorate is willing to put up with. This subject was the dominant topic of discussion among City Council members over multiple Council meetings. During the January 26th meeting, Councilman Mendell stated that he strongly favored a timeline of 20-years, "because I don't want to have to do this every 10-years." At the February 23rd meeting, Councilman Jones said that he preferred that the tax have no end, but that a 20-year horizon was acceptable since: "I may not be around in 20-years anyway." This protracted and arbitrary timeline, selected only for political expediency and to merely allude to impermanence, is no reason to support this measure. The argument in favor states that the measure "REQUIRES annual audits to ensure funds are spent as promised." While it's true that the existing ordinance does require annual audits, it's not really for the purpose of ensuring funds are spent as promised. This is because funds derived from this tax cannot be legally obligated for any special purpose. The UUT is a general tax. All its revenue is commingled with the revenue from all other general sources which ultimately funds the city's general operating budget. To promise that UUT funds will be used in a particularly special way would mean that it is actually a special tax. To pass a special tax requires a two-thirds majority vote. The UUT previously passed with only a 54-percent majority. What the UUT audit is primarily for is to ensure that the city exacts its pound of flesh. The focus of the audit is not the city's accounting records, but rather that of the utility companies. In early April, I made an official public records request to see all of the audit reports produced thus far. Over a month has past and the City still hasn't allowed me to lay eyes on a single one. The city's only response is that the documents are currently being reviewed. Were they not reviewed when they were originally received? Are they presently being edited too? This prolonged stalling is peculiar, opaque, and a violation of the California Public Records Act. What is the city trying to hide? If government transparency and promises of spending accountability are important to you, then clearly the supposed existence of these audits lends zero credibility to any argument in support of this tax. UPDATE (5/27/2016): Today, I finally received word from the City that the requested audit reports are "confidential and exempt from disclosure." This irrefutably confirms that the proponents' assurance of accountability is merely a charade. The argument in favor proclaims that "all residents and businesses will pay their fair share." I hope my argument against the measure clearly explains how this is not true. If not, here's another example to ponder: Why should a business that is heavily utility dependent, such a laundromat, have to pay an extraordinarily disproportionate amount toward city services by way of this tax than say a night-club/bar, which might have a significantly greater demand for costly police and paramedic services? Consider it honestly; all do not pay a fair share. 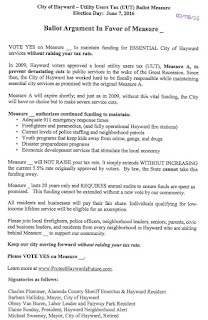 The rebuttal to the argument against the measure states "The demand for city services has increased as City of Hayward expenses also continue to rise." Demand for city services has indeed increased as the City Council rezones parcel after parcel permitting ever increasing housing density. Hundreds of new residential units are being constructed and sold, such as those in the new cannery communities off of Winton Avenue. Aside from the property tax revenue these properties generate year after year (traditionally the city's largest source of revenue), every time one of these properties is sold additional revenue is generated through the real property transfer tax. 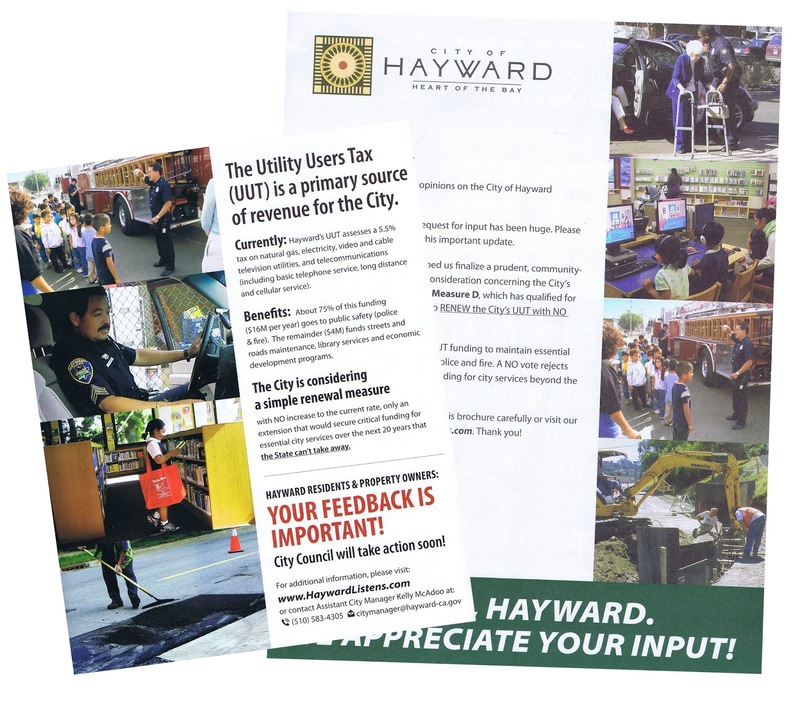 Furthermore, property owners in many newer Hayward communities are making even greater contributions to city coffers through special assessments for policing, maintenance, and lighting and landscaping. The rebuttal to the argument against the measure states: "ALL City of Hayward employees went five years with absolutely no cost of living increases in their salaries." Actually, with an unsettled labor dispute lingering between the City and its Service Employees International Union (SEIU) employees, this remains to be seen. Cost of living increases might still be awarded retroactively. Regardless, what is the purpose of this statement? To garner sympathy votes? Are the proponents of this measure so presumptuous as to imply that Hayward tax payers were doing better than city employees during these recessionary times? 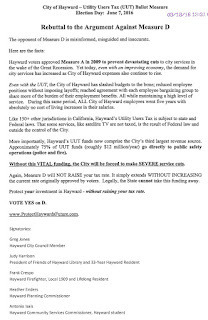 Many Hayward tax payers lost their jobs entirely, never mind having received cost of living increases. Besides, it doesn't seem that city employees did as poorly as implied. An evaluation of compensation data found on TransparentCalifornia.com reveals that many employees were receiving rather generous compensation amounts in 2011 (the first year of available data) and even more so in 2014 (the latest year of available data at the time of this posting). Have a look at firefighters. The table below shows the top earners in 2011. It compares their total compensation then with that of 2014. If you think increases in compensation were only limited to firefighters during these years, you'd be wrong. While the magnitude of increases were typically less significant, many also received greater amounts because of automatic step increases, overtime, promotions, etcetera. The rebuttal to the argument against the measure states: "Hayward's UUT funds now comprise the city's third largest revenue source." So? It didn't just unexpectedly become the third largest revenue source. The revenue amount was predicted to be the third largest when the measure was originally proposed. It's not some sort of shocking surprise that now requires continuance. Think about it like this: let's say over the next four years you expect to reduce your full-time employment and associated income because you need additional time to pursue schooling, take care of a family member, or fight a wicked illness. To help you along, a relative or friend agrees to grant you a supplemental allowance--your second largest source of income. After 4-years you return to full time work and your traditional income level is restored. At that point, do you tell your generous benefactor that the supplemental allowance must continue for at least another 8-years because you've grown accustomed to it, and because it's now your second largest source of revenue? Would you then further have the audacity to threaten your benefactor with severe and devastating consequences if it's not continued? No. To have this kind of gall, you'd have to be a politician. At the January 26th City Council meeting, Councilman Zermeño admitted that the way he's "selling" Measure D on the campaign trail is by stressing this third largest revenue angle. 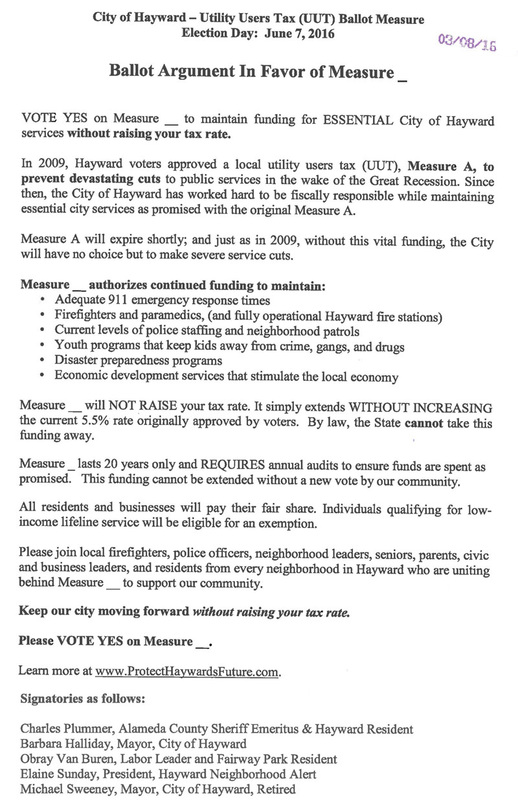 I sincerely hope Hayward voters aren't so gullible as to be buying into it. 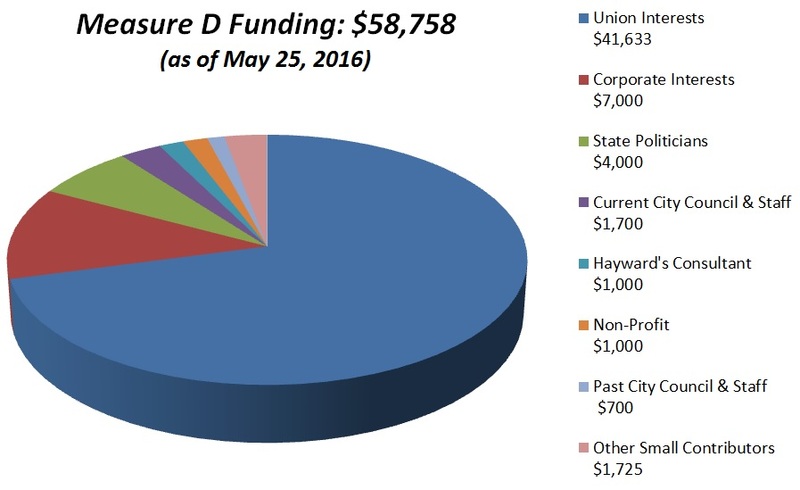 The rebuttal to the argument against the measure states: "Approximately 75% of UUT funds (roughly $12 million/year) go directly to public safety operations (police and fire)." As previously explained, the revenue from a general tax cannot be directly allocated for a special purpose. To state that there is this direct allocation is to declare the UUT a special tax. But since the measure did not previously pass by a super majority (the requirement of a special tax), the proponents are thereby indicating that the UUT, with its apparent direct allocations, is actually illegitimate. This puts the entirety of all UUT funds in jeopardy of a lawsuit that seeks to recover ill-gotten gains (thereby rendering all of the persistent allusions to the State boogeyman irrelevant). The city has already had to contend with one big ugly lawsuit due to its handling of this tax (Sipple v. City of Hayward). We don't now need a catastrophic one because of all this irresponsible fear-mongering. One of my arguments against the Utility User Tax is that it burdens neighbors disproportionately for the same privilege of accessing city services simply based on the choices one makes regarding utilities. I, for example, pay very little toward this tax, but I avail myself of the same city services as those who pay considerably more. I drive on the same roads, visit the same library, call upon the same police and paramedic services. The reason I don't pay much toward the UUT is because I happen to utilize technology that can't effectively be taxed. For TV and video I use an over the air antenna and an Internet connection. For mobile phone service I use a no-contract, wi-fi capable, cell phone that allows me to make and receive free voice over Internet calls. For my home phone and office phone I use voice over Internet calling exclusively. 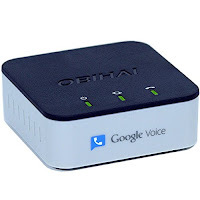 Specifically, I use Google Voice in conjunction with Obihai products. This allows me to use normal phones in a way that is every bit as good or better than traditional land line service. The best part, of course, is that it doesn't cost me anything more than the cost of Internet access and equipment. It's basically free and can't be taxed (after all, 5.5% of nothing is nothing). I coincidentally started using Google Voice around the time the UUT was enacted in 2009. There were a few hiccups early on, but it has definitely proven itself to be an incredible service and a huge money saver. I've saved well over a thousand dollars for phone service over the past 7-years. Now some who are reading this might actually be paying for voice over Internet service as part of their AT&T or Comcast bundle of services. If this is what you're doing, allow me to suggest that you're doing it wrong. If you've been coaxed into paying for VoIP service as part of a bundle to reduce your Internet access cost, you should reconsider your plan. Surrendering the package deal, in favor of just Internet access and utilizing a service such as Google Voice, is almost guaranteed to save you a ton of money. There may be other alternatives to Google Voice that might be just as good or better, but I can only recommend what I know. 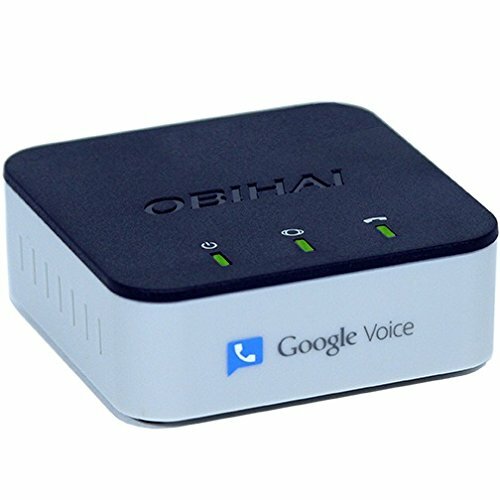 And I'm recommending Google Voice at this time, because I've become aware that Amazon will be having a lightning deal on the OBi200 VoIP phone adapter starting at 8 am tomorrow, Tuesday April 12th. You should be able to save over 25-percent off the regular price. These deals happen occasionally, but not too frequently. So you might want to check it out. 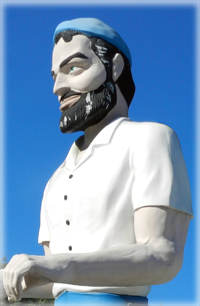 And just in case you're wondering, no, I don't have any marketing affiliation with either Google or Obihai. I receive no benefit from recommending the service or product. If you think I'm overly enthusiastic about this technology, check out the customer reviews on Amazon. There's big money to be saved. The East Bay Regional Park District has created a webpage recommending numerous short walking trails throughout its vast system of parks. These trails are described as relatively non-strenuous pathways suitable for senior citizens, parents with small children, or for anyone not ready for demanding hikes through the wilderness. 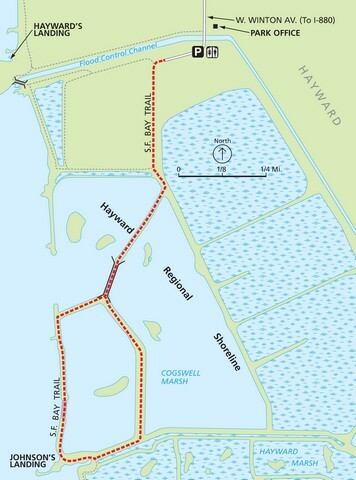 Route: (shown in red) From the parking area, head south and continue out into Cogswell Marsh. This a “lollipop” loop and you will soon be walking the head of the lollipop. Do not turn south when you reach the footbridge at Johnson’s Landing. Instead, pass the footbridge and go north to complete the lollipop loop and return to the parking area. Description: The Cogswell Marsh Loop provides users with an intimate bay experience. Thanks to an ever-present bay breeze and buffer from the city, it’s easy to forget that you’re at the center of a great megalopolis. Keep an eye out for least terns, and be sure to read the information signs that tell the interesting history of this marshland restoration. Trail type: dirt and gravel. Trail condition: good. Amenities at trailhead: parking, information, restrooms. Amenities on trail: information, benches. 2.75 miles. Elevation gain: 0 feet. Maximum grade: 0%. Route: (shown in red below) Begin from the Garin Barn Visitor Center and head south towards Jordan Pond. Take the trail around the pond and back to the parking area. Description: This quick loop around Jordan Pond takes you past popular picnic and lawn areas. You’ll see the historic Visitor Center, with artifacts from the ranching and farming history of the Hayward area inside, and a variety of antique farm equipment on display outside. As you make your way around the lake, you may see squirrels, raptors, and lizards, as well as a variety of wildflowers in the spring and early summer. Trail type: natural, fire road and narrow. Trail condition: smooth. Amenities at trailhead: Visitor Center, restrooms, benches, trash cans, recycling, information, phone, drinking water, parking, horseshoes, picnic tables. Amenities on trail: picnic areas, trash cans, benches, restrooms, fishing. .75 miles. Elevation gain: 50 feet. Maximum grade: 8%. 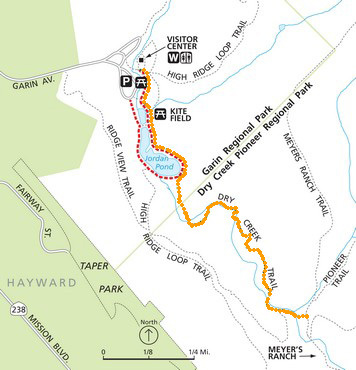 Route: (shown in orange on the right) Begin from the Garin Barn Visitor Center and head south on Jordan Pond Loop towards Jordan Pond. Turn left onto the paved beginning of the Dry Creek Trail and follow it, bearing left at the first junction, and right at the second to avoid the rougher parts of the trail. Walk until you get to the gate at Meyers Ranch Trail and turn back for your return. Description: This longer walk provides opportunities to see wildlife, grasslands, and chaparral areas. Attentive walkers may see raptors soaring overhead, lizards and squirrels underfoot, and butterflies all around in season. Dry Creek Trail is mostly shaded as it courses along the canyon bottom. Trail type: natural and paved, fire road and narrow. Trail condition: rustic. Amenities at trailhead: Visitor Center, restrooms, benches, trash cans, recycling, information, phone, drinking water, parking, horseshoes, picnic tables. Amenities on trail: picnic areas, trash cans, benches, fishing. 2.2 miles. Elevation gain: 245 feet. Maximum grade: 10%. It's been awhile since I've taken the time to write a Hayward blog post; too many other interesting things have been consuming my time. 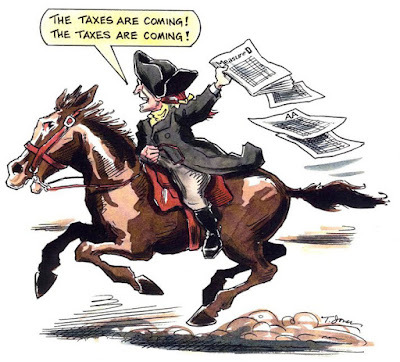 But now another election cycle has arrived, and with it, another local tax measure. 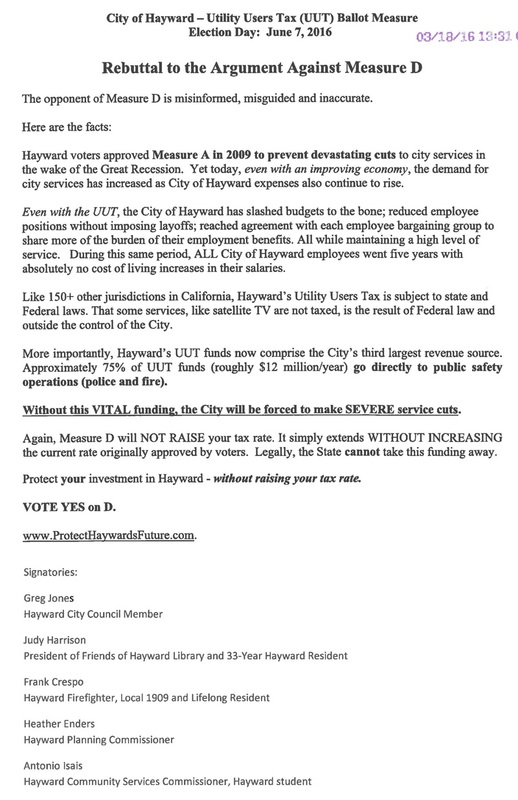 This time it's a proposal to extend Hayward's temporary Utility User's Tax for 20 more years (even though the current tax doesn't expire for another three). Truth be told, I wasn't exactly interested in this particular tax until I recently viewed a discussion among the city council and staff that took place back in January. Near the end of their conversation, our city leaders discussed whether or not there was an official argument against the original measure back in 2009. There wasn't. But the mayor went on to lament that "we might not be so fortunate this time." Well, she was right. Because at that very instant I decided; if no one else would pick up the gauntlet, I would. If there's anything I consider more pitiful than this town's apathetic electorate, it's politicians who wish that no consideration be given to alternative views. So I subsequently submitted an argument against the measure for publication in the voter information pamphlet. Since no one else did, you'll see it in the guide that's sent out around the end of April. In the coming days I'll post my argument here and further elaborate with additional future posts. With each of these I hope to open some eyes. In each instance, I'll provide, or otherwise link you to, the evidence in support of my position. Ultimately, you might not agree with my perspective. But if you follow this blog up until the time that you cast your vote, then at least you'll have the good sense to form a considered opinion by taking into account an alternative point-of-view. Wouldn't it be nice if all our politicians did the same? Last night's rain and today's comfortable temperatures have brought out the swarmers. No, not lazy Halloween zombies who have belatedly risen from soggy graves. I'm talking about something much more menacing--flying termites. Actually, flying termites are not all that menacing. It's the colonies from which they emerge, or the ones they might create, that represent the real danger. Winged termites, or swarmers, are those that are leaving an established colony to reproduce and create new ones. These swarmers have no biting or chewing mouthparts. Consequently, they themselves pose no immediate risk. But their presence in large quantities indicates a significant nearby nest and a potentially growing threat. Well established subterranean termite colonies can have hundreds, thousands, or even hundreds-of-thousands of wingless worker termites. Given enough time these tiny, but voracious, workers can turn your wood home into dust. So be on the lookout. If you spot a line or cluster of these insidious winged insects on, in, or around your home, now or in the future, you'd be well advised to follow up with a thorough home inspection and any advised corrective action. Most local pest control companies offer free termite inspections. On tonight's City Council Consent Agenda is a resolution to award a construction contract for a new library and park plaza. According to the subject staff report, the cost for the project will be about $65.7-million. But, let's be honest, that's not really the total amount. What the report neglects to mention is the cost of the required financing. That amount has to be inferred from another source. Architectural rendering of Hayward's proposed new library--the front entrance at C Street. A July staff report on financing authorization identifies the need to borrow $53-million for the project. This amount is to be paid back over a period of 20-years at an interest rate of as much as 4-percent. This will result in an overall finance charge of nearly $25-million and an overall project cost of about $90-million. Allow me to state the obvious: $90-million is a tremendous amount of money. It's equivalent to $600 for every man, woman and child living in Hayward ($90,000,000 ÷ 150,000). But the expenditure isn't just massive, it's risky as well. In response to the requirements of the California Environmental Quality Act (CEQA), the City issued a Mitigated Negative Declaration for the project. It includes eight appendices of investigative reports that collectively total over 1,300-pages of information including such things as tree health, noise levels, and historical resource quality. Yet it doesn't include a single page of what is perhaps the most important document of all, the site's geotechnical study. Why is that? Fault. Map Image from CA Dept. of Conservation. Being that the site is located within a regulated earthquake fault zone, shouldn't the public (and perhaps those who actually authorize the project) know the full extent by which the site's seismic risk was investigated? More specifically, how does it demon-strate, as required by California's Alquist-Priolo Act and City policy, that the proposed structure won't be built across an active fault? There doesn't appear to be any surface disturbance at the project site that is large enough to suggest that a proper trenching study had been performed. In fact, the text of the Neg Dec indicates that only cone penetrometer testing (CPT) was conducted. If this is true, it's woefully insufficient. For a project of this type, size, and cost, considerably more ought to be done. Guidelines for evaluating the hazard of surface fault rupture published by the California Geological Survey (CGS) state that trenching needs to be conducted in conjunction with other methods. It also states that CPT must be done in conjunction with continuously logged borings. Nothing in the Neg Dec indicates that this has occurred. It's widely known that a creep trace of the Hayward Fault is located no farther from the building site than the proposed building is wide. This separation is apparently sufficient for some to presume that the Hayward Fault represents a less than significant impact to the safety of the site. But seismologists at both CGS and the United States Geological Survey (USGS) have told me that a known creep trace is not a definitive indicator as to where a significant surface displacement might occur during a major seismic event. A trenching study at Tyson's Lagoon in Fremont, for example, has revealed that adjacent to a known creep trace is another active trace of the Hayward Fault that appears to only move during major events. Additionally, Jim Lienkaemper of USGS has told me that many trenches in the wider Hayward Fault zone have revealed second and third order fault traces away from the main creeping trace that are active and in most cases are believed to have moved in a seismic rupture. These numerous inconspicuous possibilities for lateral shift across a wide swath of a fault is the reason that the Alquist-Priolo Earthquake Fault Zones are as wide as they are and why appropriate investigations are required. Not withstanding the potential physical danger posed by not properly investigating a site, the failure to demonstrate proper compliance with the Act exposes the City to enormous financial liability for possible negligence. One section of the Alquist-Priolo Act effectively strips away the "act of God" defense by stipulating that a city that does not comply with specific provisions of the Act "may be liable for earthquake-related injuries or deaths caused by its failure to so adhere." I've previously heard project proponents brush aside concerns over any seismic risk. They've confidently stated that the proposed library will be a robust steel structure built to modern building code standards. Design professionals and city officials shouldn't have to be reminded that our modern building code doesn't guarantee anything. It merely defines minimum building standards in an effort to reasonably protect public health, safety, and general welfare. In a worst case scenario, the hope is that today's minimum standards are sufficiently adequate to provide occupants enough time to escape a structure before it might ultimately suffer catastrophic failure. As demonstrated by past deadly failures constructed to standards that were considered modern for their time, success is not guaranteed. Our knowledge and, consequently, our regulations are constantly evolving. Case in point, a UC Berkeley study published earlier this year revealed a newly discovered connection between the Hayward Fault and the Calaveras Fault. This connection supposedly increases the amount of energy that could potentially be released during a major event by more than 2½-times that which had previously been thought possible. Will future building standards for this very project site be revised to consider greater local ground accelerations based on the new findings? Probably. But regardless of regulations, be they modern or not, no building, steel or otherwise, can withstand a massive lateral shift of the earth directly beneath its foundation. During a major seismic event, it's believed that the Hayward Fault has the potential of shifting 4-feet or more. Any building walls straddling such a rupture will most definitely yield. 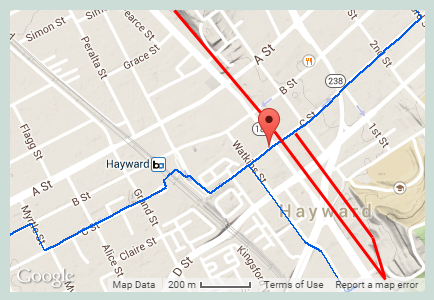 known creep traces of the Hayward Fault (both added by this blog). There's also a potential-ly exacerbating issue not even mentioned in the Neg Dec.
Just a few steps from what will be the new library's front door lies a PG&E, high-pressure, gas transmission pipe-line -- the kind that exploded 20-miles to the west in San Bruno in 2010. As can be seen on the inset PG&E map, this high-pressure gas line crosses the Fault Zone perpendicularly at C Street. PG&E believes it has addressed the threat posed by fault crossings with the installation of automatic shut-off valves. However, not being able to find any detail as to the actual extent of its efforts, I remain dubious. And apparently, I'm not alone. The Public Utilities Commission has also indicated a lack of confidence in PG&E's safety policies and practices by announcing last month its consideration of an investigative review. Don't forget that the principle cause of San Francisco's citywide destruction in 1906 was not due to the shaking earth, but to the relentless fires that ensued--which were abundantly fueled by broken gas lines. Some will suggest that we have nothing to fear. After all, Fire Station No. 1 is only a block away at C Street and Main. Unfortunately, however, that building may be similarly at risk. 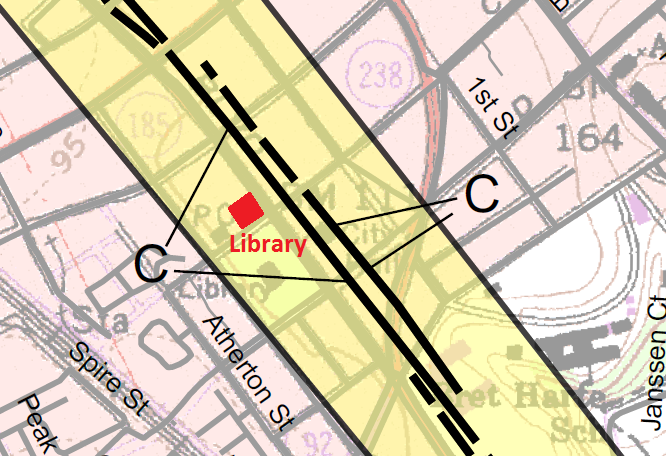 Like the proposed library, it's located within the earthquake fault zone, across the street from an identified fault trace, and immediately adjacent to the PG&E gas transmission line. Hayward PD Substation. Main St at its front, fault trace at its rear. And if that doesn't suggest a cavalier attitude toward the city's namesake fault, then consider that across from the fire station is the local police substation. It's located in an old masonry structure (constructed in 1927) whose rear wall sits inches from a mapped fault trace, and it too is immediately adjacent to the high-pressure gas transmission line. Clearly, if the City considers a site like this suitable for its public safety personnel, then nothing must be off limits for other civic buildings. This then begs the question: hasn't anything been learned from history? Hayward has a rather unfortunate legacy with regard to its public buildings. The city's first permanent library, the Carnegie Library, was located just over a thousand feet from the proposed project site. It was substantially damaged during the historic 1906 earthquake. The abandoned City Hall on Mission Blvd, which sits kitty-corner to the proposed project site, was constructed directly atop one of the creep fault traces. It's now slowly being ripped in half. 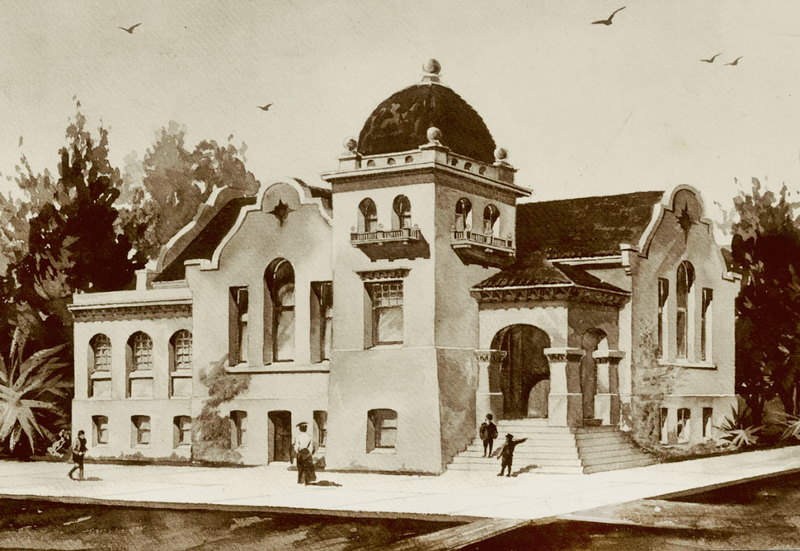 The city's widely admired Union High School was torn down and the site abandoned because it was considered too seismically hazardous. But then the City Center complex was erected at the very same spot only to be rendered useless by the 1989 Loma Prieta quake. How is it that one city can have such an infamous record? It's partly out of stupidity and partly out of pride, but mostly it's due to simple ignorance. Decision makers generally didn't know any better. The fact is the Hayward Fault wasn't mapped, nor a regulatory fault zone established, until after most of these structures were constructed. Today, however, we know better. Therefore, it has to be asked. If in the future this incredibly expensive project becomes prematurely unusable simply because of its risky location (like the fiasco of LA's Learning Center Complex) then what's going to be our excuse?